These 20- and 15-year-old wild mature stallions who were born and lived wild and free on the range, faced an uncertain future. 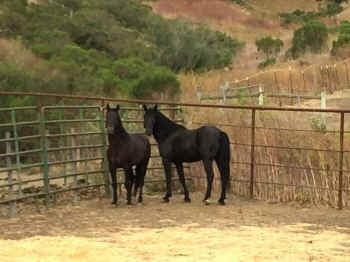 Return to Freedom (RTF) purchased these elders for a mere $25 each so we could give them a permanent home at our California sanctuary with our Sulphur Springs herd. This morning, we welcomed these two stallions to the sanctuary! 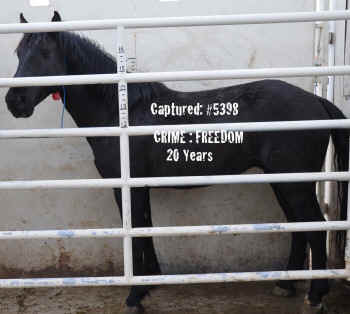 In the past month, national attention focused on the plight of a beautiful 25-year old wild grulla stallion, #3907, who was captured by the BLM from his home range in the roundup of about 100 horses on February 27, 2015 in the Sulphur Springs HMA, Utah. Less attention had been paid to other senior stallions who were also captured from the Sulphur Herd Management Area in February and caged at the holding facility in Delta, Utah. Older wild horses have lived their whole life in a herd and have survived within the rules and conditions of natural law. Thanks to a few concerned donors, RTF was able to purchase a twenty year old black stallion #5398, and a 15 year old Bay stallion (#5422), both who had no bids at all. These wild mature stallions who were born and lived wild and free on the range, faced an uncertain future. RTF purchased these elders for a mere $25.00 each so we could give them a permanent home at our California sanctuary with our Sulphur Springs herd. This morning, we welcomed these two stallions to the sanctuary! They are settling in and will eventually join our herd in the hills. While we can’t give these stallions back their freedom, with your help we can give them the respect and security they deserve in their twilight years. Caring for senior horses costs an estimated $2600 per year which does not include Veterinary care. Horses at the sanctuary often live well into their thirties. Please help Return to Freedom and support sanctuaries with a generous contribution today! Create a national coalition of over 50 organizations. Create a sanctuary management model which supports our advocacy efforts for solutions to keep wild horses free on the range. Pioneer a model and provide the vehicle for groundbreaking cooperative agreements that has saved over 200 hundred Virginia Range wild horses and could keep thousands more free on the range. Engage a diverse group of Americans (adult and youth) in experiential educational programs and inform them on the issue. Duplicate our efforts in: sanctuary, maintaining family and bonded groups, threatened strain conservation, innovative educational programs and eco-safari tours.